Do you remember the post where Doug and I met ChefMichael Psilakis? We were thrilled to have met him in person and receive an autographed copy of his cookbook, “How to Roast a Lamb”. Chef Michael is passionate about his family and career, and is extremely down-to-earth. If we lived near any of his New York restaurants, we’d certainly be regular diners. Instead, we are content to watch him on TV - and I follow him on Facebook. In one of his recent Facebook posts, Chef Michael shared a recipe for grilled watermelon with yogurt. Since it’s summer and the temperature is soaring, I felt this would be a refreshing recipe to pass along. In Chef Michael’s version, he prepares this on an outdoor grill. I’ve not only adjusted this recipe to suit our taste, I also use my indoor, counter top George Foreman grill for this recipe – no fuss, no muss, and no excessive heat! Naturally, use whichever type of grill you like. Don’t want to heat up a grill? No problem! Skip grilling the watermelon altogether, and call this ‘Chilled Watermelon with Yogurt Topping’. If you prefer the non-grilled method, you can omit step 3 which calls for drizzling oil on the melon slices, and sprinkling with salt and pepper. 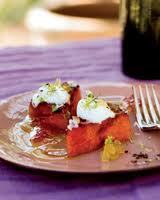 Here’s my version of Chef Michael Psilakis’ Grilled Watermelon with Yogurt. 1. In a bowl, combine the yogurt with the lemon juice, zest, 2 Tbsp. of the chopped mint, and 1 tablespoon of olive oil. Mix in salt and pepper to taste. 3. Drizzle the watermelon triangles with olive oil and season with salt and pepper. Place 2 melon slices on the GF grill at a time, close the lid, and grill until nicely charred, about 1 minute. Continue grilling until all melon slices are done. 4. Transfer melon to serving plates. Top each slice with a dollop of yogurt sauce. Drizzle with olive oil; garnish with the remaining mint and serve.